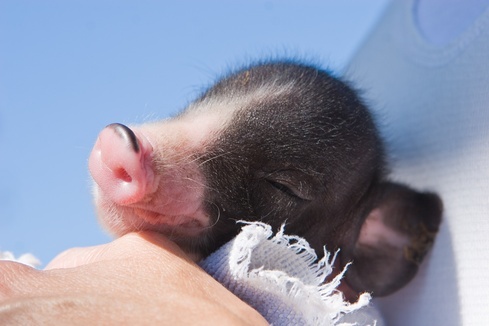 Pigs are widely considered to be one of the smartest species on the planet, along with chimpanzees and dolphins. Scientists tell us they are smarter than dogs and three year old human children. 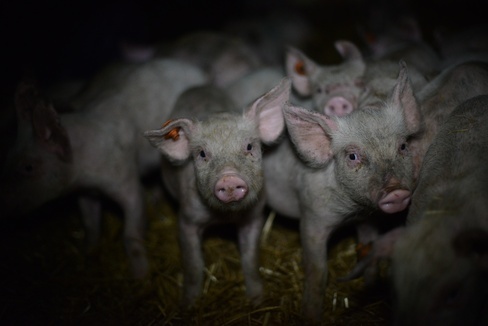 Standard farming practice is to remove piglets from their mothers when they are less than one month old, cut their tails off, cut their teeth off, and castrate the males, all without any pain relief. Anyone who did these things to a dog would be sent to jail, and yet because of some artificial distinctions we have drawn, we have made dogs our companions and pigs our food. Pigs spend their entire lives in overcrowded pens on a tiny slab of concrete. More than 170,000 pigs die in transport each year, and more than 420,000 are crippled by the time they arrive at the slaughterhouse. Breeding sows spend their entire lives in tiny metal crates called gestation crates so they cannot turn around. Shortly after giving birth, they are forcibly impregnated. This cycle continues for years until their bodies finally give up and they are sent to slaughter. Vansickle, J. "Quality Assurance Program Launched," National Hog Farmer, February 15, 2002, which reports that each year 420,000 pigs are crippled and 170,000 killed during transport to slaughterhouses, cited in Williams, Erin E. and DeMello, Margo. Why Animals Matter. Prometheus Books, 2007, p. 49. Izzy, pictured above, was the runt of a litter of 15 born at a seasonal produce market that had rented Izzy’s mom as an attraction for the visitors. Izzy was so tiny when he was born, the people working the market took him away so he wouldn't get stepped on, but they didn't know what to do with him. Fortunately, a compassionate customer convinced the market’s owners to allow her to bring the tiny piglet to a nearby sanctuary, Poplar Spring Animal Sanctuary in Poolesville, MD. The customer ended up going back to the market and rescuing one of Izzy’s brother’s as well. Even the people running the market commented to bystanders who were there that day that these were the lucky ones. The mother and the rest of the babies were returned back to the farm to be slaughtered.